Yudhika’s Durban inspired menu….inspired by the old days! A trip down memory lane is what inspired my last Mela menu! It all started when I came across a rather vintage set of AMC pots that were from the 70’s. My mom also had a set but this set was a little older. These pots are always part of my kitchen memories. They were so flash in their day that serving dishes were hardly ever used in my home and it is still the same for me today! As good as new or even better! The AMC set after re-polishing! 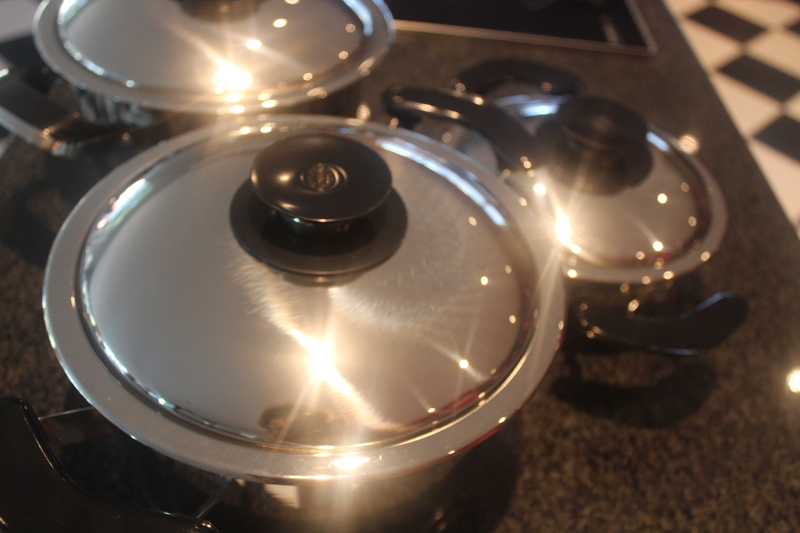 The various sized cookware were re-named in an Indian household and I am sure that some of my Indian followers will relate to the ‘rice pot’, ‘breyani pot’ and ‘fish curry pot’ – all names to describe the pots in the AMC range…and there was also a ‘dhall pot’. Kaye and Tamsyn from AMC Cookware looked quite puzzled when I mentioned these names during a meeting! And I am slowly learning to call them by their ‘good names’ like 30cm gourmet roaster, 24cm high, etc. I was first tempted to leave the vintage set of AMC as is but asked Kaye and the AMC team to do an AMC overhaul! 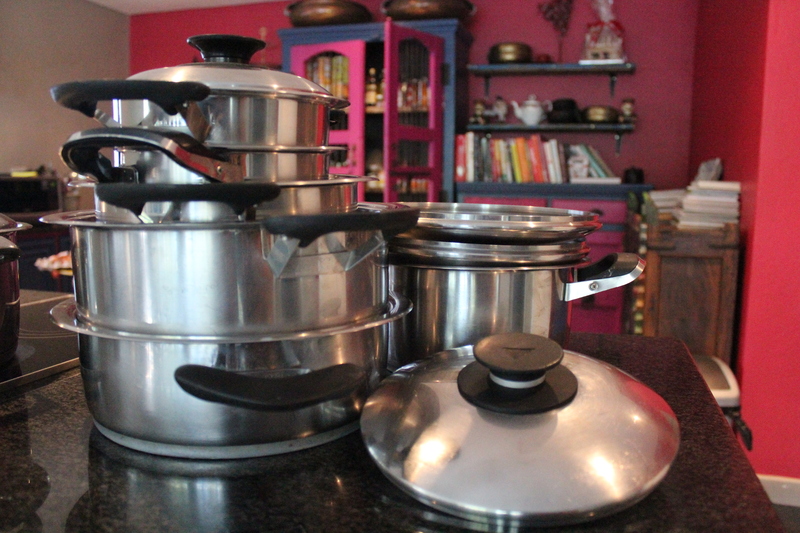 The pots arrived and I couldn’t believe that they looked brand spanking new…after over forty years of service! 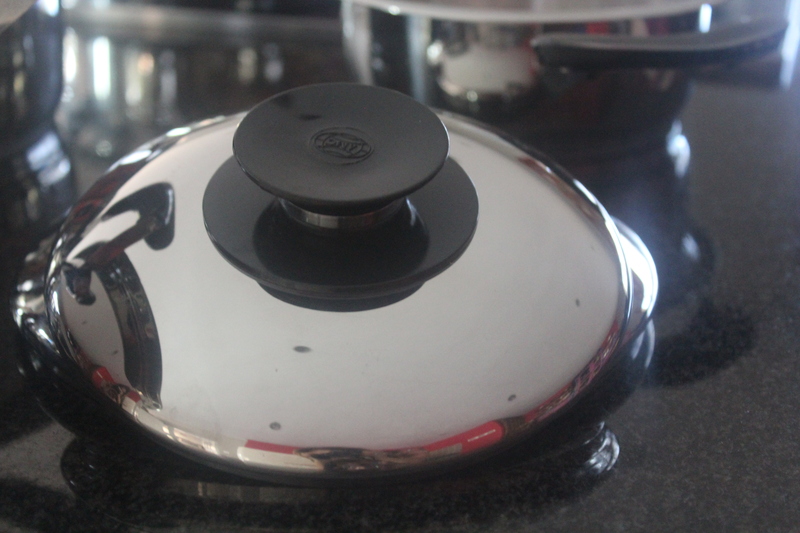 Looking at the old style handles and knobs on the lids, is like tripping all over food memory lane! I mentioned the names that the cookware is given in an Indian home…and to celebrate old fashioned food, I did a Mela menu inspired by my childhood. 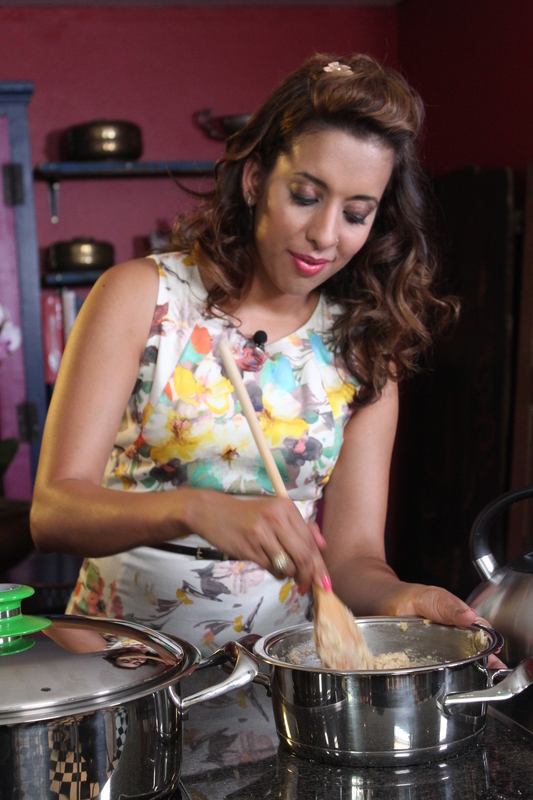 Yudhika cooking up a storm on Mela! We lived in Isipingo and for a while we lived in Isipingo Beach. My grandfather was a keen fisherman and loved to take my cousins and I on fishing trips! I even had my own fishing rod! My gran would pack a picnic basket and we would be off for the day. The best part of the fishing trip would be to get home and my mom would season the catch of the day with red chilli, salt and a light sprinkling of turmeric. This was the best fried fish ever! 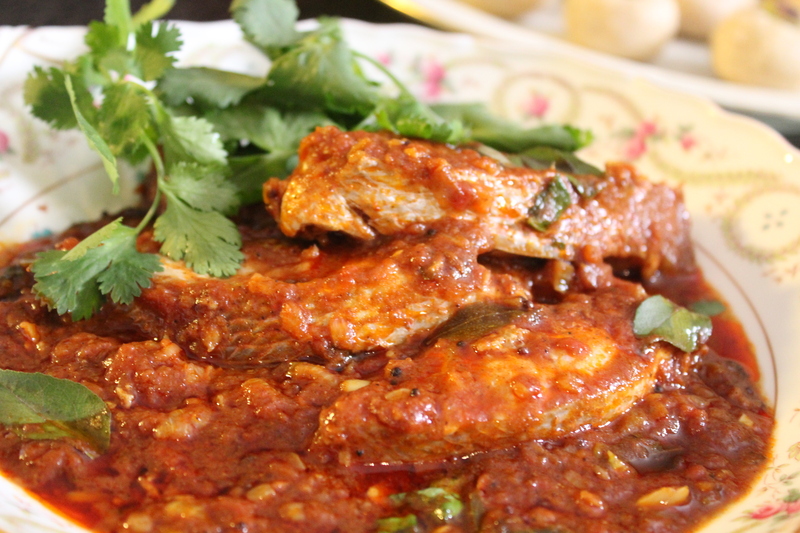 Sometimes she would also prepare a devilishly hot fish curry cooked with tamarind and tomatoes. On the Mela menu for the week….Durban Fish Curry cooked in my AMC fish pot and Soji Balls! Soji Balls are ones of my favourite childhood treats and when I spotted a tray of them at a prayer, I swear I would pray would one eye open! They were hard to resist and every time us kids attended a prayer, we couldn’t help thinking of the treats that would come our way! Here’s the fish curry recipe just how I remember it…. 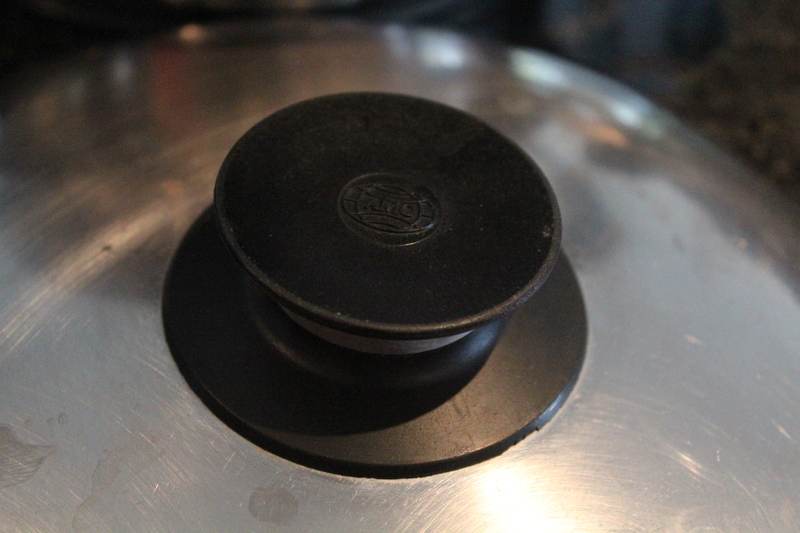 Heat the sunflower oil in a 30cm AMC pot. Add the mustard seeds and once the begin to pop. Add the cumin seeds and fry until the sizzle and turn a shade darker. Stir the onion and salt into the oil. Saute the onions until they turn golden brown – I also add a few curry leaves to get the aromas going! Add the crushed garlic and ginger and fry for a few seconds until fragrant. Stir the red chilli powder into the oil and fry for 3 – 5 seconds, then add the tomatoes. Add the ground cumin, coriander and turmeric and simmer the sauce until the tomatoes form a smooth paste – use the back of a wooden spoon to break down the lumps. While the tomatoes are simmering, dissolve the tamarind in boiling water – if you are using tamarind with seeds, you will have to strain the liquid to remove the fibres and seeds. When the tomatoes have cooked down and are completely soft, add the tamarind and then place the fish steaks into the sauce. Poach the steaks in the sauce and simmer on a very low heat until the sauce has thickened – the cooking time depends on the thickness of the fish steaks. Sprinkle in a little sugar to balance the sharpness and acidity of the tomatoes.